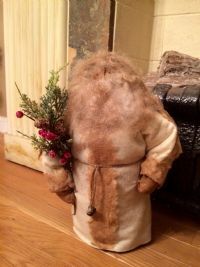 This santa is made from aged light brown felt. 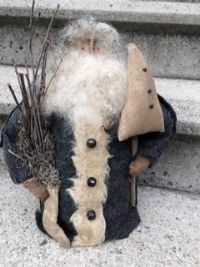 His beard is primitve grunged wool. He has a bunch of greens tucked under one arm and the other arm has a hanging star. Bells down the front 14" stands. Love this new cranberry flannel aged santa with hood. He has a sack on his back filled with sticks. Grungy beard. Stands 20"
This santa is made from aged flannel. He is wearing a cream felt coat and hood. His beard is grunged for a peferct old time look. weighed to stand 12"